The Estonian Hound is a scenthound that was originally developed to hunt fox and hare. In a secondary role it has also been used as a house and property guard. This breed remains rare and is virtually unknown outside the eastern parts of Europe. The Estonian Hound was created in the middle part of the 20th century when the Soviet Union ordered every Soviet Republic to establish a local breed of hunting dog to replace the larger dogs that were blamed for the decline of local wildlife. These larger dogs were primarily made up of Russian, Polish and Finnish hounds, as well as the English Foxhound. 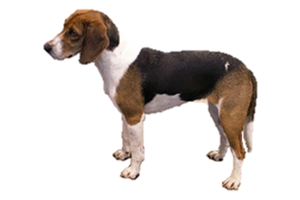 To decrease their size Beagles, Bernese Laufhunds, and Lucerne Laufhunds were later added. Is the Estonian Hound Right for You?